Reliance Jio is offering its customers a total of 16GB complimentary data as part of its second anniversary. Reliance Jio is offering its customers a total of 16GB complimentary data as part of its second anniversary. According to a Telecom Talk report, Jio will give its users 8GB data in the month of September and another 8GB in October under its Jio Celebration pack. Users can avail 2GB free data per day for four days over and above their recharge plan. Whether Jio’s Celebration pack will be available to all its users is unclear. The report adds that the pack validity will likely differ with every user. 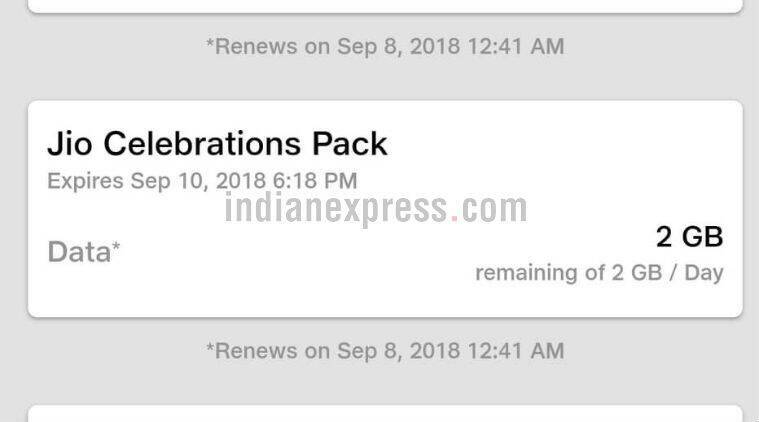 Jio Celebrations Pack can be checked for by users in the ‘My Plans’ section of their MyJio app. The pack should reflect under the active plan section. The Jio Celebration Pack was live for a Jio number being used in our office as well. In our case, the pack expires 6:18 PM on September 10 and renews at 12:41 AM on September 8. Jio is giving it users 2GB data per day under this offer. Reliance Jio launched its mobile services commercially on September 5 in 2016. Disruptive data prices as well as unlimited free voice calling benefits has helped Jio sustain its user base and also add new customers quickly. Reliance Jio has added close to 200 million subscribers in a little less than two years. Earlier this week, Jio rolled out its ‘Cadbury Dairy Milk, the wrapper that gives’ offer for its customers. Valid till September 30, users can avail 1GB free additional 4G data by scanning barcode from wrapper of a Dairy Milk chocolate under this offer. It is live on MyJio app, and free additional data will be transferred to the user’s MyJio account within seven to eight working days.